Your Beach Town House Is Ready For You! MAKE ME AN OFFER ! cool fall and winter evenings. beach or a cool winter's night. Flat Screen TV, Fenced in back yard with hot tub, gas grill and seating for 9 for an outdoor fish grill, or a safe place for the kid's to play and the "poochi kid's". too ! New Sleeper Sofa and down recliner to relax after a day on the beach. Also, Internet, flat creen tv, music, I Pod stand and Max channel's on TV, blue ray player and more. Well stocked kitchen if you decide to buy our fresh seafood and have a cook out on the patio. 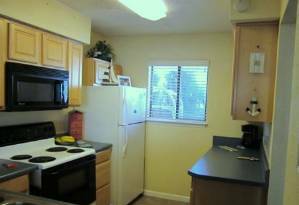 Well stocked kitchen has all the modern conveniences to make your vacation stay labor free. Dishwasher, Microwave. WE NOW A NEW SOVE AND OVEN !!! SO SORRY FOR THE INCONVENIENCE THAT IT MAY HAVE CAUSED (BLAME IT ON REPAIR MAN) ;) ALSO,REMEMBER TO CHECK OUT OUR DISCOUNTED RATES! AND~~~ WE WELCOME SPRING BREAKER'S ! AND NEVER FORGET~~ "MAKE ME AN OFFER" ! February 5, 2014 Reviewer: Marsha From: Trenton, Mi. We spent a month in Panama Cityy Beach and had a wonderful time. 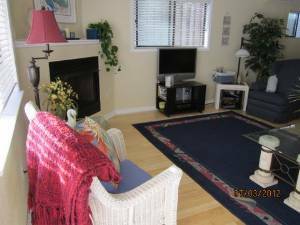 The condo is a short walk across the street to the beach. There are two restaurants within walking distance. Our little dog was happy and at home in the yard! Suzanne took care of our concerns promptly. I would check with her before you book to make sure the oven works if that's a concern for you. The beds were very comfortable! The condo is roomy and nicely decorated. Very quiet neighborhood when we were there in January which was nice. Neighbors were friendly. 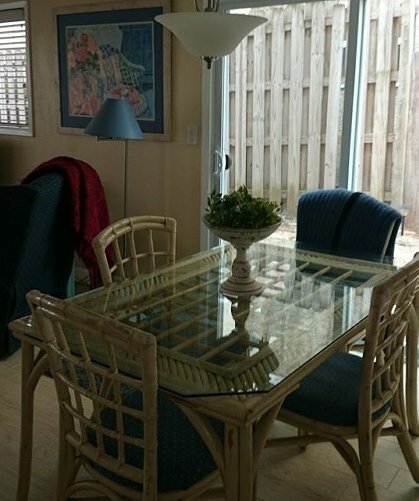 This home is a very short walking distance from the beach and very close to other activities as well. The owner Suzanne was extremely nice and very helpful! She was only a phone call away and always answered every question we had. She really helped us a lot and made our stay very pleasant! 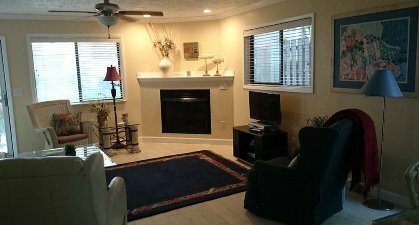 We would recommend this home to anyone that is staying in the area. Suzanne will treat you well! We will definitely be contacting her for future visits to PCB! Thank you Suzanne for sharing your beautiful home with us and for being so nice and making our stay very pleasant and enjoyable! We hope to visit again very soon! God Bless! We had a group of 8 girls drive down to PCB for spring break and stayed at Suzanne's townhome. It was a perfect sized place for the amount of people we had and worked out awesome. We walked to the beach every day almost and walked to the down town area at night. The walk to town seemed a little far but was totally manageable. The hot tub got a lot of use and was a nice addition for the price we were paying. While we were there the stove wasn't working which put a damper on group cooking but having all of the other appliances readily available was awesome. We enjoyed our stay for sure. The townhouse was very comforable with plenty of room. Although we were there in July, it was still perfect in the evenings to use the hot tub. My husband and I walked to the beach every morning which only took about 5 minutes to walk there. I would have to say during the time we were there, our location was sooo much better than fighting the traffic on Front beach road. We were only 8 minutes from St. Andrew's State Park where they have a beautiful beach. I spoke with Suzanne a couple of times on the phone. She was very pleasant. But if you need anything, I recommend that you call her instead of email because I didnt always get a response by email. She did answer all her calls though. Thanks Suzanne! Our family had a wonderful time in Suzanne's condo. It was very comfortable and clean. The location is perfect because we simply walked less than a block to the beach. We did a lot of fishing too, however we spent more on feeding the fish than catching them- My dad said he could have just bought the fish haha- but it was the sport of trying that made it worthwhile. The condo had all the amenities we needed and It is very pet friendly. My dog Quincey enjoyed his first experience in Panama City Beach. Thanks Suzanne and hope to return again soon! We had an amazing time here! The town house was beautiful and the beds were very comfortable. The hot tub was nice in the Other than that it was perfect! 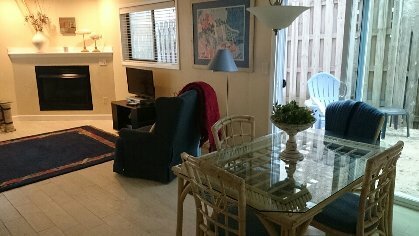 Nine of my friends and I stayed in this townhome for spring break and we had a blast. The place was very clean and easily fit everyone. It was also in a great location. It was about a 4 min walk to the beach and a small walk to the crazy part of the beach. So, it was perfect because we had the choice of just relaxing on the beach or meeting a lot of people. In addition, it was within walking distance of La Vela and other clubs. Also, the owner was extremely nice and helpful. Overall, it was a great experience and we would all do it again. I would recommend staying here to anyone. We had a very nice stay. The house & the area were very clean & quiet. We were close to the beach, shopping & restaurants. We got to meet the owner, she wanted to be sure everything was as it was supposed to be and it was. 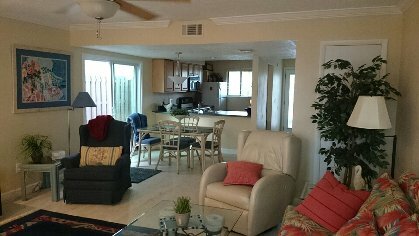 I would recommend this vacation home highly next time you stay in Panama City Beach. Our family of 5 was totally happy from the time we arrived at Beach Drive through our departure date. We stayed a week. The townhouse was just like home. The neighborhood was very quiet. We found everything we needed already there. The location is close to everything. We were literally 2 minutes from the Seltzer Pavillion, so we packed up and went to the beach everyday! The owner answered my every phone call (and I called her several times) with directions to stores, recommendations on restaurants and other family fun. We were so pleased that we have already booked to return next year! The townhouse was great. It had everything that we needed and it was only a 5 minute walk to the beach, which was beautiful and not crowded at all like the other end of PCB. I would definitely recommend it to others, especially military b/c she does give discounts. Thanks Suzanne for helping to make our vacation great! From one coast to another, we had a blast. You have a great rental that is the best we have found yet. Most of all, everything we needed was there or very close. The Rick Seltzer Park was a great asset to a day at the beach. I think it was McAuther who said "I shall return", We will, and thanks for a great stay. What a great vacation! The townhouse was exactly what we needed and so comfortable and close to everything but far enough away from the noise. We loved the beach neighborhood, too. We will be back and make this our beach vacatio home for future trips. Suzanne, you were great to work with and keep a clean and well stocked rental. Till we arrive again, thanks! We really appreciate the town house. We enjoyed our stay. What fun. We will see you next summer! What a wonderful beach house! We had such a great time and the location was close to everything! The decor, beds are great and comfy, kitchen and great room so clean and made us feel right at home. It was just as you said "family friendly". 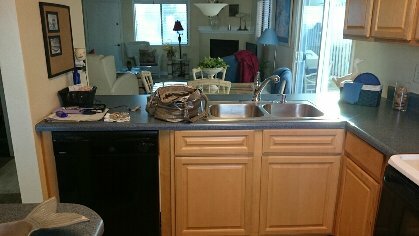 Suzanne, you were a delight to deal with and have made your rental one that we will stay each time we visit PCB. PLEASE ASK ABOUT OUR SENIOR & MILITARY DISCOUNTS! CALL FOR OUR SNOWBIRD SPECIALS, EXTENDED STAY AND OFF SEASON SPECIAL'S LET'S MAKE A DEAL! I WANT YOUR RENTAL! 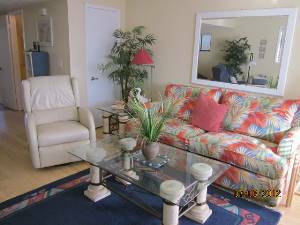 :) RATES FOR AGES 25 AND UNDER ARE $1400.00 WEEKLY CLEANING DEE $150.00 AND RESERVATION DEPOSIT OF $500.00.PLEASE CALL FOR REQUIREMENT'S FOR STUDENTS. Deposit: The $300.00 is a reservation as well as a damage deposit. The deposit will be held as a damage deposit as well as a reservation deposit. Your deposit will be refunded after inspection of the unit. We expect that the unit be in good, clean condition upon departure.. Your deposit will be returned within two week's of your departure. Cancellations and Refunds: Your RESERVATION / DAMAGE DEPOSIT of $300 is non refundable IF you cancel six week's prior to arrival. If we are able to fill in your spot, you will receive half of your deposit fee. Thank you ! Other Fees: Pet deposit of $50.00 is a nonrefundable deposit.